GeniusGroup.xyz is a conglomerate of eight leading professional service providers, each specializing in a unique service area. Each branch of Genius Group works independently of the others, but strategizes with the company as a whole. When your company needs to register a business in a new country, the group will make it happen. 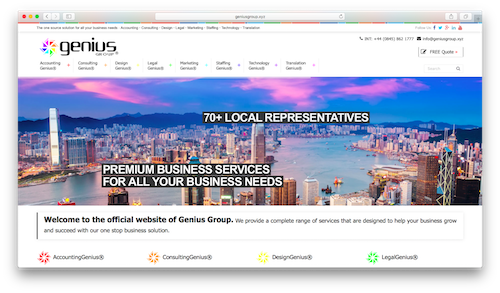 Genius is proficient in accounting, consulting, design, legal, marketing, staffing, technology, and translation. Genius Group counts clients in aviation such as Qatar Airways and British Airways as their clients. Technology companies like Sony, Dell, Microsoft, Canon, as well as Vodafone and Nokia also rely on Genius for some of their projects. Even consumer goods firm Nestle and energy companies like Total can be counted as GeniusGroup.xyz’s clients. More than 10,000 followers get the latest business tips and tricks through Genius’ twitter page and many follow their updates on Linkedin and Facebook. With their genius domain, they are confident to handle any business challenge you throw at them. GeniusGroup.xyz’s pioneering spirit aligns with .xyz’s vision for the next generation of the internet. Follow them on social media or connect with them today on their website.